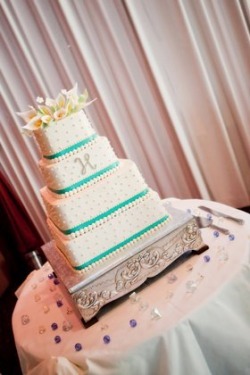 I want our cake to be square, with the Tiffany blue ribbon at the base of each cake. I love this cake. credit-citytoshore09. 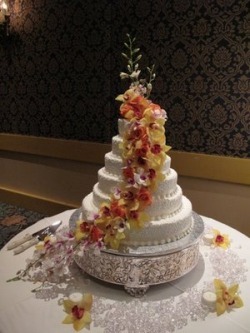 I will be using a partial bling wedding cake monogram F as our topper and I want orchids cascading on the side. Our wedding cake will be 4 tier and alternating flavors. 1st flavor is butter pound cake with raspberry filling and 2nd one is chocolate cake with hazelnut filling with cream cheese buttercream icing. 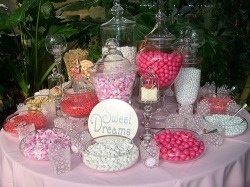 Im thinking of having a candy bar for our guests to take candy for their favors. 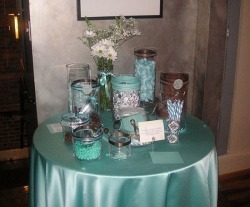 If not the candy bar I will do something as an edible favor since the guest are also having a photobooth picture to take as well.